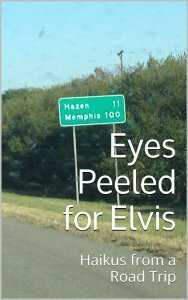 If you stumble upon this post by Friday, December 5, you can receive a free e-book I published on Amazon, Eyes Peeled for Elvis: Haikus from a Road Trip. As I drove to New Hampshire from Texas to take my daughter Suzannah to her new job at New Beginnings, I recorded the trip on social media with a series of Haikus and many of my friends answered in Haiku form. Some are funny, some just slightly amusing, and some are bittersweet. This book includes my own Haikus and some from my friends, including a couple of award-winning poets. The e-book is free until Friday. After that, it’s still a bargain at $2.99. Any profits we make from this project will be donated to New Beginnings, an organization to prevent domestic and sexual violence and provide support, advocacy, and/or shelter for victims. Got it! Read it in bed last night. Slept well. Don’t know if the two things are related.